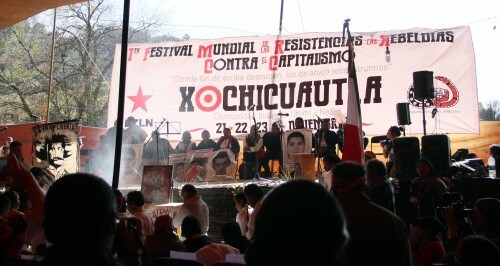 The spokesperson for Xochicuautla, José Luis Fernández, has denounced that personnel from the construction company and government agents have been invading their forests, this despite the precautionary measures released by the National Commission for Human Rights (CNDH). These ended on 10 August, thus leading to the expression of concern for the well-being of the residents of the community amidst the possibility that the expropriation be carried out. “We do not doubt that in the next few days, despite the precautionary measures, police will prepare their invasion,” he added. The spokesperson further noted that there are rumors that the Army will invade to occupy the land, such that he called on civil society to be attentive to what might happen in the next few days. Beyond this, it was announced that on 30 August the traditional authorities will release a “counter-decree of reappropriation” that would symbolically invalidate the expropriatory decree released by the federal government. 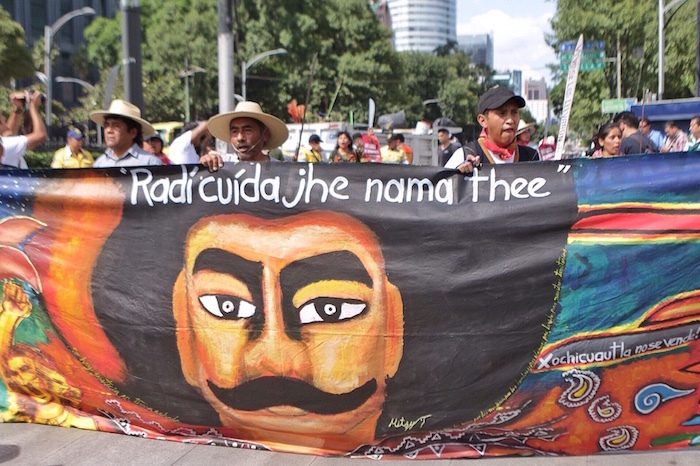 According to Antonio Lara, from the Zeferino Ladrillero Center for Human Rights (CDHZL), the idea is to counterpose the ancestral vision of rights before the Western concept. “The public interest is not above any right. 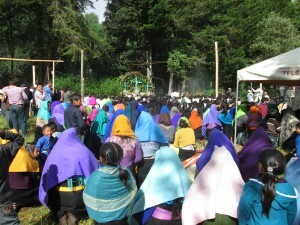 Rights are violated for business.” Other indigenous peoples are invited to the ceremony, such as the Nahua of Ostula, the Yaquis from Sonora, and San Salvador Atenco, besides intellectuals and the bishop Raúl Vera. 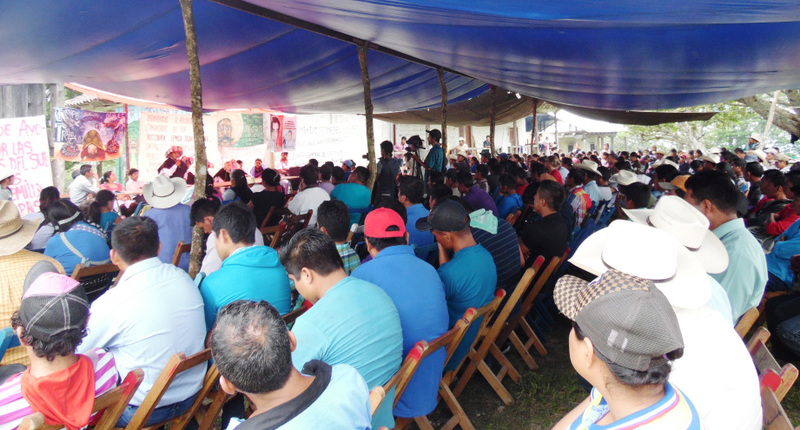 Collectives and civil organizations attended the event, in addition to the brigade of solidarity with Bachajón from the Network against Repression and for Solidarity. 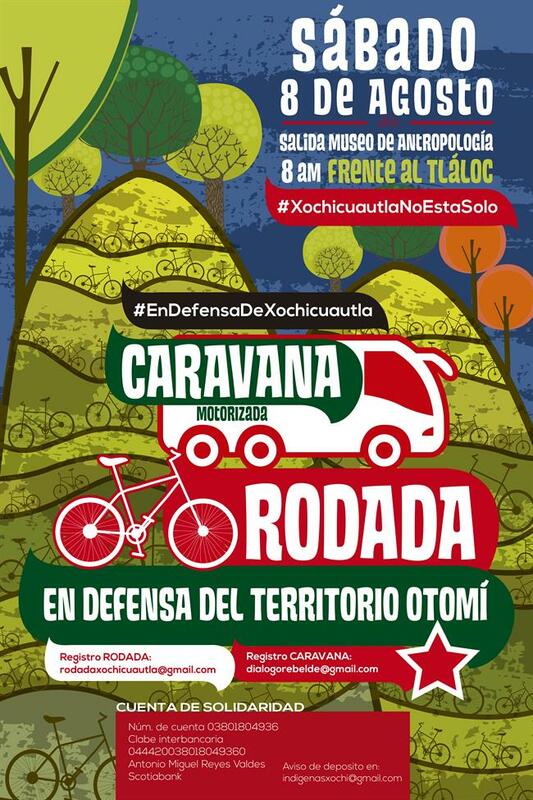 The Otomí people from San Francisco Xochicuautla, Mexico State, who similarly oppose the Toluca-Naucalpan highway, sent a letter in solidarity. Ricardo Lagunes, the lawyer who accompanies the legal process of the Los Llanos ejido, denounced that there was no free, prior, and informed consent in the case, as is demanded by the international treaties that Mexico has signed, in order to avoid the situation wherein indigenous peoples are affected by projects in their territories over which they have no say. He recalled that the announcement of the construction of the highway was made in November 2013, such that the community requested a legal motion at the beginning of 2014. The official response was to deny that the highway would damage the lands of Los Llanos, thus allowing judges to bury the motion and leave the communities vulnerable. Lastly, the Council for Vigilance from La Candelaria has organized a pilgrimage for 25 November in San Cristóbal de Las Casas to mark International Day for the Elimination of Violence against Women.